West Bromwich - West Bromich Albion moved comfortably clear of the Premier League relegation zone with a hard-fought 1-0 win over Stoke City at the Hawthorns on Saturday. A first-half strike from Brown Ideye sufficed to give all three points to the Baggies who were in command early on only for Stoke to dominate the latter stages of the match. 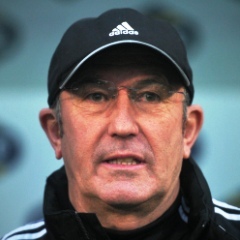 West Brom coach Tony Pullis could have been forgiven for having mixed sentiments before the match having spent eight successful years at Stoke. But his men piled on the pressure from the start, Stphane Sessegnon and Saido Berahino both having early shots at goals. The Baggies deservedly took the lead after 19 minutes when Ideye rose above the Stoke defence to power a Craig Gardney cross into the bottom left corner of the net. Darren Fletcher and Berahino both came close to doubling the home side's lead before Peter Crouch blasted one over as Stoke tried valiantly to get back into the game. West Brom had kept five clean sheets in their last six home games at The Hawthorns underlining the size of the task facing Mark Hughes' men in the second half. Their hopes were briefly raised after 55 minutes when outstanding goalkeeper Ben Foster was injured and had to be replaced by Boaz Myhill. But shortly after that, Stoke winger Victor Moses was also forced to leave with an injury, Marko Arnautovic taking over. The visitors were now on top and forced a succession of corners which came to naught before Fletcher and Berahino had shots blocked at the other end. Crouch had a header well saved by Myhill as time ran out for Stoke who failed to repeat their 2-1 win in the same fixture last year. The win moved West Brom on to 33 points, well clear of the drop zone, but still nine points adrift of Stoke.